Pilot Mountain State Park - Take a Hike! Pilot Mountain State Park is a state park about 15 miles north of Winston-Salem and 15 miles south of Mount Airy in Surry and Yadkin Counties. The closest town is Pinnacle. There are two sections of the park - the Mountain Section and the River Section. The Mountain Section includes Pilot Mountain and River Section includes a part of the Yadkin River about 6 miles south of Pilot Mountain. The Corridor Trail runs between the two sections. 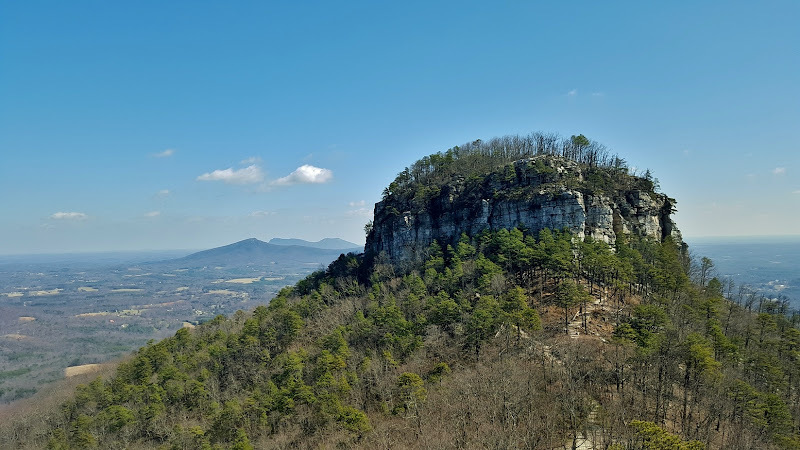 Pilot Mountain is one of the remaining peaks of the ancient Sauratown Range, which also includes the mountains in Hanging Rock State Park and Sauratown Mountain on private land. The peak is erosion-resistant quartzite which has resisted the erosion that wore down the surrounding areas over millions of years. The native Saura Indians called the peak Jomeokee, meaning "Great Guide" or "Pilot", because the conspicuous pinnacle, rising 1,400 feet above the surrounding countryside, acted as a guide to Native Americans and early European settlers. The mountain was first mapped in 1751 by Joshua Fry and Peter Jefferson, father of the third president. After being a commercial tourist attraction, Pilot Mountain became the 14th North Carolina State Park in 1968 through community efforts to protect the mountain and surrounding countryside from development. In 1970, 1,000 additional acres of land along the Yadkin River was added to the park and additional land has been added since, bring the total area of the park to 3,703 acres. Pilot Mountain State Park is located about 16 miles north of Winston-Salem and about 14 miles south of Mount Airy in Surry and Yadkin counties. There are two separate sections of the park - the Mountain Section and the River Section. Directions to each are listed below or use the map to generate customized direction. The Mountain section of the park is located just off US-52 between Winston-Salem and Mount Airy. From US-52, take exit 131 and travel west into the park. The park office will be on the right and the road leads up to the summit of the mountain. The Corridor Trailhead parking is located on Pinnacle Hotel Road, at the south end of the Mountain Section of the park. From US-52, take exit 129 for Perch Road. If coming from Winston-Salem, turn right on Perch Road; if coming from the north, turn left on Perch Road. Go about a mile and turn left on N Old 52 and an immediate left on Surry Line Road. In about a mile, the road will change to Pinnacle Hotel Road as it crosses under US-52. Go another three-quarters of a mile and the parking area will be on the left. The Grindstone Trail is about 2 miles and starts across the street from the visitor center. The trail parallels the park road to the campground area then begins a steep climb up to the summit. In about 1.5 miles, the Mountain Trail splits to the right. In another half-mile or so, the trail intersects with Ledge Springs Trail. Bear left at the fork to stay on Grindstone/Ledge Springs Trail as it follows an old road bed to the summit. 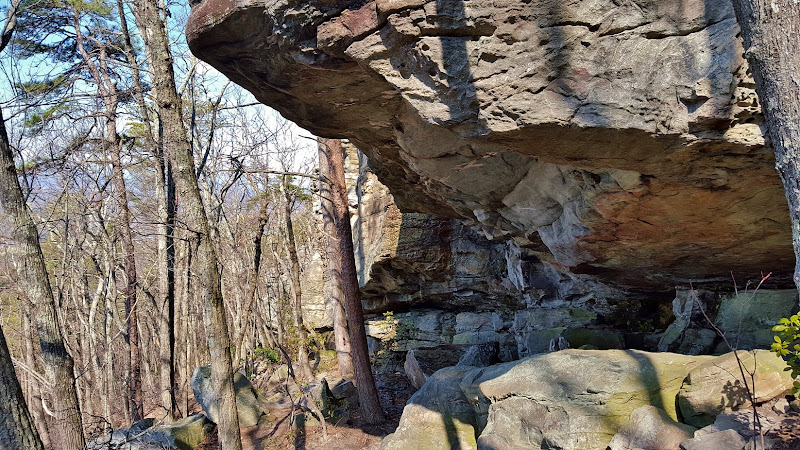 Near the top, there are great views from the tops of cliffs used by rock climbers on Ledge Springs Trail below. The Jomeokee Trail is just under a mile and starts from the summit parking lot and forms a loop around the Big Pinnacle. Since climbing is prohibited on the Big Pinnacle, this trail is as close as you can get. The trail crosses the saddle between Big and Little Pinnacles and then splits to make a loop. Walking around the Big Pinnacle, one can see just how big the pinnacle really is. The Ledge Springs Trail starts at the summit parking lot and leads down along the Grindstone Trail. About a mile or so down, the trail splits to the left and makes a steep and rocky climb back to the Jomeokee Trail. This section of the trail is popular with rock climbers, as the cliffs along here are the only place in the park where climbing is permitted. This part of the trail is strenuous as there are numerous rocks and steps to climb. Little Pinnacle Overlook is a very short trail from the summit parking lot to an overlook at Little Pinnacle. The best views of the Big Pinnacle can be seen at the overlook, as well as Sauratown Mountain and Hanging Rock in the distance. The Mountain Trail begins just south of the visitor center, splitting off from Grassy Ridge Trail. The trail runs clockwise around the mountain. Near the southern end, a half-mile spur leads to the Corridor Trailhead parking. The trail continues from here around the mountain, gradually gaining in elevation. The other end of the trail is at the intersection with Grindstone Trail. Continuing on Grindstone Trail provides a loop leading completely around the mountain. Pilot Creek Trail is the newest trail in the park, built by volunteers from the Friends of Sauratown Mountains. The trail starts from parking off Boyd Nelson Road. It leads past tributaries of Pilot Creek through the northwest part of the park, ending at Grindstone Trail near the campground. Trout lilies are a common early spring wildflower found in the park. They are named for their mottled leaves that resemble trout.